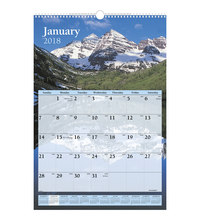 At-A-Glance Scenic Design Photographic Monthly Wall Calendar offers planning pages for 12 months ranging from Jan - Dec. Calendar measuring 15-1/2 in x 22-3/4 in is featured with Julian dates and full chipboard backer. Calendar containing 30% post-consumer materials has monthly reference calendars such as one past month, current month and 10 future months. Calendar featuring a new photo in each month is rendered with bonus page which contains a current yearly reference calendar in back.